This is the next stage completing the washes of watercolor for the pileated woodpecker. This leg in the journey accomplishes a roughing in of the colors and composition. I currently am using watercolor to allow greater freedom with my drawing and provide more intensity. Do many of you work with mixed media and if so, what are your techniques? 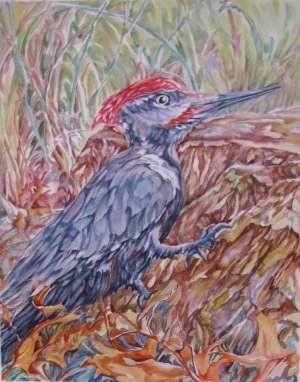 You are currently reading Rough Stage with Watercolor for The Pileated Woodpecker at Dr. Mary McNaughton and Drawing.